The licensed practitioner of Religious Science will hold a book signing session at the country’s largest book festival. Dale Olansky, the author of the spirituality/New Thought book “Fear to Faith: A Daily Guide to Finding Solace in an Uncertain World” (Park Point Press; 2019), will be attending the Los Angeles Times Festival of Books. First held in 1996, the free public festival will kick off on April 13-14, 2019 at the campus of University of Southern California in Los Angeles, CA. An essential part of the city’s educational and cultural scene, the L.A. Times Festival of Books promotes literacy and the love of reading yet it features more than just books. Attendees will find new and original works of art and photography on display and the event will showcase poetry readings, panels with authors, storytelling, book signing sessions, culinary classes, and musical performances. Olansky, whose book “Fear to Faith,” will be exhibited by ReadersMagnet at the event, is one of the authors who will have a book signing session, which is scheduled on April 14, Sunday, at 12:30pm-1:30pm. “Fear to Faith” is comprised of 365 inspirational messages and affirmations that give the reader a new way to look at life and the world by seeing the good that is present no matter what is showing up. Be inspired by Dale Olansky’s powerful messages and affirmations and embrace change today. 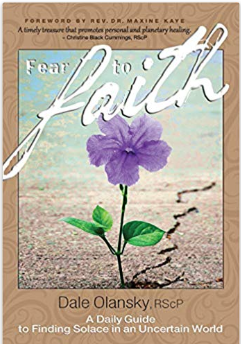 Order “Fear to Faith: A Daily Guide to Finding Solace in an Uncertain World” through Amazon and have it signed by the author at her scheduled book signing session.